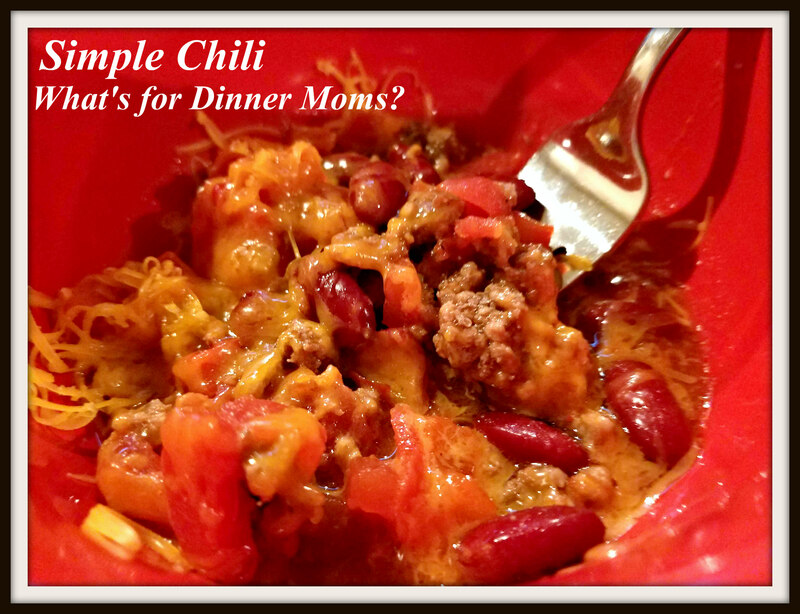 Simple Slow Cooker Chili – What's for Dinner Moms? Chili is one of those hit or miss dishes for me. I like the meat, not a lot of beans, but I still want it to be hearty and filling. I don’t like it too soupy. I want the sauce to have some substance to it not be tomato juice. I like a few tomato chunks but not all chunky tomatoes and it has to be substantial enough for me to eat with tortilla chips, not a spoon. I guess I am a bit picky, hmmm. I did get a picture of the chili with cheese over it but forgot to get a picture of the sour cream and us eating it with tortilla chips. Everyone liked this version, especially me because if wasn’t overly fussy to make. Other than browning the meat and onion in the skillet there was no thought to the dish. We served this with cheddar cheese, sour cream and tortilla chips for dinner. This makes great leftovers over potatoes or fries, or a hearty lunch. Tip: When you are cooking ground beef cook an extra two or three pounds and divide it up into freezer bags when cooled. Store it in the freezer for quick easy meals like this one or tacos on busy days when you don’t want to or don’t have the time to cook the ground beef first! A simple hearty chili that you can eat with a tortilla chip! Add onion and allow to soften, then add garlic and saute 1 minute longer. Pour onions into slow cooker. Return skillet to medium-high eat, add beef and cook stirring occasionally until beef has browned.Drain most of fat from beef, leaving about 2 Tbsp in with beef. Pour browned beef into slow cooker. Super simple dishes that cook all day are right up my alley! Awe, how sweet of your mom! I never think to make dishes like this in the summer. What a great idea! I’m really picky about what goes in my chili too, although I do like to experiment. I see you do use my “secret ingredient” (the chili powder) in yours too. I love that added depth of flavor it adds. Typo — darn it! I meant to say cocoa powder.. Sounds strange but adds so much. Lol! I wasn’t sure what you meant but I get it now! Rocks every time! I made this last week. Yum 😜 Thanks for sharing! Is there left for me or finished?